Mr. Jolson’s persuasive vocal efforts were received with rousing applause. In fact, not since the first presentation of Vitaphone features, more than a year ago at the same playhouse, has anything like the ovation been heard in a motion-picture theatre. And when the film came to an end Mr. Jolson himself expressed his sincere appreciation of the Vitaphoned film, declaring that he was so happy that he could not stop the tears. The Vitaphoned songs and some dialogue have been introduced most adroitly. This in itself is an ambitious move, for in the expression of song the Vitaphone vitalizes the production enormously. The dialogue is not so effective, for it does not always catch the nuances of speech or inflections of the voice so that one is not aware of the mechanical features. The Warner Brothers astutely realized that a film conception of “The Jazz Singer” was one of the few subjects that would lend itself to the use of the Vitaphone. It was also a happy idea to persuade Mr. Jolson to play the leading role, for few men could have approached the task of singing and acting so well as he does in this photoplay. His “voice with a tear” compelled silence, and possibly all that disappointed the people in the packed theatre was the fact that they could not call upon him or his image at least for an encore. They had to content themselves with clapping and whistling after Mr. Jolson’s shadow finished a realistic song. It was also the voice of Jolson, with its dramatic sweep, its pathos and soft slurring tones. One of the most interesting sequences of the picture itself is where Mr. Jolson as Jack Robin (formerly Jakie Rabbinowitz) is perceived talking to Mary Dale (May McAvoy) as he smears his face with black. It is done gradually, and yet the dexterity with which Mr. Jolson outlines his mouth is readily appreciated. You see Jack Robin, the young man who at last has his big opportunity, with a couple of smudges of black on his features, and then his cheeks, his nose, his forehead and the back of his neck are blackened. It is also an engaging scene where Jack’s mother comes to the Winter Garden and sees him for the first time as a black-face entertainer. Some time afterward Jack Robin is perceived and heard singing “Mammy,” while his old mother occupies a seat in the front row. Here Mr. Jolson puts all the force of his personality into the song as he walks out beyond the footlights and some times with clasped hands, he sings as if to his own mother. The success of this production is due to a large degree to Mr. Jolson’s Vitaphoned renditions. There are quite a few moments when the picture drags, because Alan Crosland, the director, has given too much footage to discussion and to the attempts of the theatrical manager (in character) to prevail upon Jack Robin not to permit sentiment to sway him (Jack) when his great opportunity is at hand. There are also times when one would expect the Vitaphoned portions to be either more subdued or stopped as the camera swings to other scenes. The voice is usually just the same whether the image of the singer is close to the camera or quite far away. Warner Oland does capable work as Cantor Rabinowitz. May McAvoy is attractive, but has little to do as Mary Dale. In most of her scenes Eugenie Besserer acts with sympathetic restraint. Cantor Josef Rosenblatt contributes an excellent Vitaphoned concert number in the course of the narrative. Al Jolson and the Vitaphone. THE JAZZ SINGER, with Al Jolson, May McAvoy, Warner Orland, Eugenie Besserer, Cantor Josef Rosenblatt, Otto Lederer, Bobbie Gordon, Richard Tucker, Natt Carr, William Demarest, Anders Randolf and Will Walling; based on the play by Samson Raphaelson; directed by Alan Crosland; Vitaphone interpolations of Mr. Jolson’s songs and orchestral accompaniment by Vitaphone. 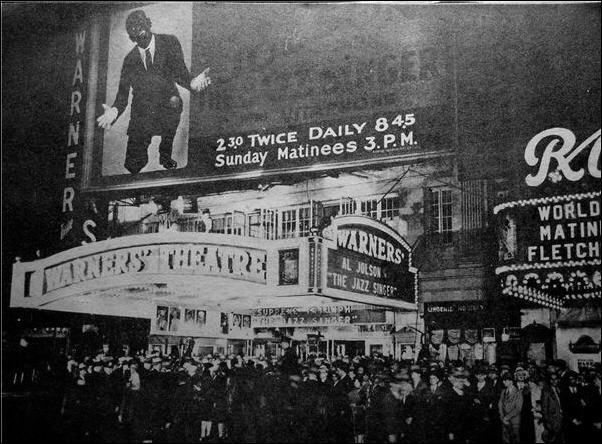 At Warners’ Theatre.